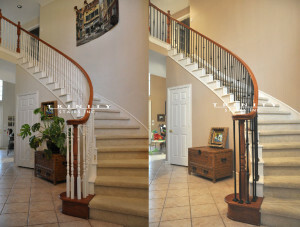 Trinity Stairs can sometimes complete a simple stair remodel in less than a day! Many customers have improved their home�s appearance by upgrading their wood balusters to decorative iron. This simple baluster replacement usually takes just a few hours and can make a very big difference in the look of your home. Other popular remodeling projects include replacing your carpet with wood or tile. Many flooring companies offer this service, but be careful, as we have seen many flooring companies use flooring material on stairs rather than solid wood. A stair step should be constructed of a solid piece of wood. We typically use a hard wood, such as Red Oak, but other woods and materials can also be used. Below are the quick steps for getting started with a simple stair remodel. 1. Obtain a Free Quote – Counting the number of balusters on your stairs and having digital photos are a big help. 2. Product Selection – Check our online selection of baluster patterns and designs. You can also visit our showroom or work with our designers. 3. Preparation – While we try to limit the amount of dust produced, it is impossible to completely eliminate all dust. Covering furniture in the vicinity of your stair is highly recommended. 4. Tear Out – Old balusters are cut and removed. and epoxied into existing holes. 6. Clean Up – We will remove and dispose of all of the old balusters and vacuum the stairs to remove any wood chips and debris. warming party. Tell them how great it was to work with Trinity Stairs!